Veneers are routinely used to cover teeth which are discolored, worn, chipped, or misaligned. Veneers are used for many of the same reasons as bonding but they involve a different procedure. If you are looking for a dentist in Toronto to find a solution for worn or misaligned teeth, give Yonge Dentistry a call at (416) 489-6955 and our dentists can help you find solutions such as Veneers. Porcelain veneers are an excellent way to cover up aesthetic flaws, including discoloration, misshapen teeth, gaps, cracks and minor misalignment. Veneers are thin, custom-made shells made from tooth-colored porcelain, designed to cover the front side of your teeth. It is a cosmetic procedure that is most commonly used to give you perfect looking teeth. 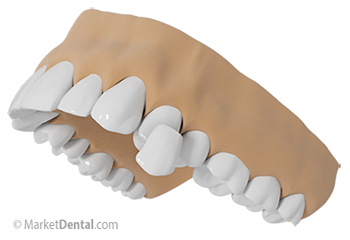 Strong and durable, they’re designed to mimic the natural translucency of enamel, so they look and feel completely natural. They can change the colour, size and shape of your teeth to give you a straight, bright, attractive smile. Veneers are thin shells of porcelain or resin that measure less than 1.5mm thickness. First, the doctor will prepare your tooth and then take an impression of the prepared tooth, possibly place a temporary filling in the space, and send the impression to a dental laboratory to have the veneers manufactured. It’s a process that takes a couple weeks and can usually be completed in only two office visits. The custom veneers are then permanently bonded to your natural teeth. Although veneers are more expensive and time-consuming than bonding, they conserve tooth structure when compared to crowns. Typically veneers are difficult to stain, making them a very popular solution for many people seeking that perfect smile. Strong and very durable, veneers usually last from 10 to 15 years, and come in colors that will brighten dark teeth without the worry of them changing colour. If you are looking for an experienced dentist in Toronto for veneers, please give Yonge Dentistry a call at (416) 489-6955 to schedule a consultation with our dentist.